The Romanian prime minister has denied allegations that two abattoirs in his country sold horsemeat purported to be beef to European food companies. Victor Ponta said checks had been carried out and there had been no breach of rules and standards. The abattoirs had been linked to the contamination of processed meat products sold in Europe. UK Environment Secretary Owen Paterson said he spoke to his Romanian, Irish and French counterparts on Monday. He hopes to meet them and the European Commissioner for Health and Consumer Policy Tonio Borg later this week. He is due to update the House of Commons on the scandal on Monday evening. The discovery of horsemeat in beef products has led to processed food being withdrawn from sale in Britain, France and Sweden. Mr Ponta expressed anger that his country had been blamed. "From all the data we have at the moment, there is no breach of European rules committed by companies from Romania or on Romanian territory," he told a news conference. "I am very angry, to be honest." In France, the government has summoned meat industry representatives for crisis talks. Seven French supermarket chains have already withdrawn frozen ready meals made by Findus and food supplier Comigel. An initial investigation found the meat originated from Romania. French investigators have visited two companies involved in the import and processing of meat to try to establish at what stage the horsemeat was labelled as beef. The UK government says that an "extensive" criminal conspiracy may have taken place. Mr Paterson told the BBC: "This is a case of fraud and a conspiracy against the public, this is a criminal action, substituting one material for another." Legal action is set to begin in continental Europe on Monday and his European counterparts were agreed that this was a case of fraud, he said. 'Unwelcome news' The controversy surrounding contamination of meat products has also affected firms in the Irish Republic and Poland. Mr Paterson told the BBC a factory in Luxembourg, which has been linked to the French cases, had to issue warnings to 16 different countries. He said he did not know how widespread the problem was but "we have to be prepared for more unwelcome news". Tests were continuing and it was the responsibility of the retailers to "convince their consumers of the validity and quality of their products", he said. 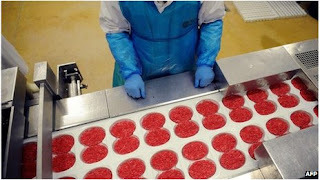 Mr Paterson added that the Food Standards Agency's (FSA) advice was to continue buying and eating processed beef products, but if any evidence of a serious threat to health emerged "we will act very swiftly". The FSA has ordered food businesses to conduct authenticity tests on all beef products for significant levels of horsemeat and the deadline for the first set of results is Friday 15 February. Last week Findus UK took its frozen beef lasagne, made by Comigel, off the shelves after some were found to have up to 100% horsemeat in them. Findus UK said the only product on sale in the UK using ingredients from the French supplier had been its beef lasagne and all other beef products on sale in the UK had been DNA-tested and cleared. The FSA has asked Findus to test their contaminated beef lasagne for the veterinary drug phenylbutazone as animals treated with "bute" are not allowed to enter the food chain. The results are expected in the next few days. The Chief Medical Officer for England, Dame Sally Davies, said: "It's understandable that people will be concerned, but it is important to emphasise that, even if bute is found to be present at low levels, there is a very low risk indeed that it would cause any harm to health."